Is this okay, or is it wrong? After all, this was part of the Law of the Old Testament. However, if you understand how Christ came to fulfill the Law and listen to His teaching, you will see that in no way is revenge acceptable. Let us see what Jesus and other men of the Bible say on this issue. Matthew 5:17 says, “Do not think that I have come to abolish the Law or the Prophets; I have not come to abolish them but to fulfill them.” Jesus did fulfill the Law and He went even farther with it. Let me show you what I mean. Here are two verses that Jesus quotes from the Law of the Old Testament and His response to them. Jesus responds with, “But if anyone slaps you on the right cheek, turn to him the other also. And if anyone would sue you and take your tunic, let him have your cloak as well. And if anyone forces you to go one mile, go with him two miles.” (Matthew 5:39-41) What’s the point of this? The answer is found at the end of the chapter. “Love your enemies and pray for those who persecute you, so that you may be sons of your Father who is in heaven…you therefore must be perfect, as your heavenly Father is perfect.” (Matthew 5:44,45a and 48) If we are to be sons and daughters of God, then we must strive to be perfect as God is perfect. Think about it. How will you or I win someone to Christ by slapping them in the face or repaying them evil for evil? Did Christ crucify the human race because He was? Certainly not! The crucifixion was the greatest act of love ever! We can learn a LOT about love when we focus on Christ’s complete willingness and obedience that gave us redemption through His blood. Revenge is not a topic of the Bible that is up for debate. The book of Romans is a wonderful book of the Bible and it covers a multitude of topics. Revenge is one of those topics. Paul gives a great explanation on it in Romans 12:14-21 which says, “Bless those who persecute you; bless and do not curse them. Rejoice with those who rejoice, weep with those who weep. Live in harmony with one another. Do not be haughty, but associate with the lowly. Never be wise in your own sight. Repay no one evil for evil, but give thought to do what is honorable in the sight of all. If possible, so far as it depends on you, live peaceably with all. Beloved, never avenge yourselves, but leave it to the wrath of God, for it is written, “Vengeance is Mine, I will repay, says the Lord.” To the contrary, “if your enemy is hungry, feed him; if he is thirsty, give him something to drink; for by so doing you will heap burning coals on his head.” Do not be overcome by evil, but overcome evil with good.” It doesn’t get much clearer than this. We are called to love our enemies and not to retaliate against them. If God says, “Vengeance is Mine,” (Deuteronomy 32:35a) then we need to follow in obedience. 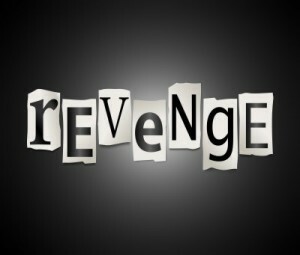 Revenge is not a topic of the Bible that is up for debate. The answers are crystal clear. We should never show revenge to anyone. We are called to love one another, including our enemies and persecutors. Jesus “came to seek and save the lost” (Luke 19:10), and we should model the same attitude. God bless you as you live a life worthy of the calling! Resource – The Holy Bible, English Standard Version “Scripture quotations are from The Holy Bible, English Standard Version® (ESV®), copyright © 2001 by Crossway, a publishing ministry of Good News Publishers. Used by permission. All rights reserved. The government is set up by God to enact earthly justice. Police are appointed by government to keep the laws of the land. We are to obey them as set up by God. If someone is or is about to harm my family, then they will be met with force. The context you are stating is that people are oppressing you because you are Christian, then be a witness. Many crimes today are not because we are Christians but because we can be taken advantage of and our material possessions. We should never do anything from the offensive but we are not refrained from protecting our families from bodily harm. Hello Jerry, let me first state that revenge is an “after thought”. It is something that you dwell on to get back at someone. If someone breaks into your home, of course defend your family. That is completely different from revenge. Good points though. Defending your home is definitely something that we should all do. God bless! Revenge and defending yourself are two different things. The Bible is not telling us to be doormats. Exodus 22:2. Turn the other cheek was in reference to insults. Hello Troy. As I said to Jerry, revenge is an “after thought”. Revenge is a mindset of “I’m gonna make them pay” type of attitude. Defending yourself because you are backed into a corner is a completely different issue which has nothing to do with revenge and all to do with survival. Does that make sense? No where in this article do I express that we should be door mats. Jesus wasn’t and we shouldn’t either. God bless! We don’t need to seek revenge. Vengence is mine says the Lord. Amen Annette! God is the only one that should seek vengeance. God bless! Outstanding work here brother. This is so different from the way the world thinks. We even pray for those who despite us. By the way, Mrs. Hughes, I believe Derek is saying the same thing…that we don’t seek revenge…yes, vengeance is Gods. And to Troy…Derek never indicates that we are to be doormats and I don’t see Derek saying that in this fine work. To “turn the other cheek,” does not imply pacifism, nor does it mean we place ourselves or others in mortal danger. Like the principle of the eye for an eye and tooth for a tooth in Matthew 5:38, turning the other cheek refers to personal retaliation, not criminal offenses or acts of military aggression. Clearly, Jesus did not mean to negate all God’s laws and injunctions protecting us against violent crime or invading armies. Rather, Jesus is speaking here of the principle of non-retaliation to affronts against our own dignity, as well as lawsuits to gain one’s personal assets (v. 40), infringements on one’s liberty (v. 41), and violations of property rights (v. 42). He was calling for a full surrender of all personal rights. Turning the other cheek means not to return insult for insult in retaliation, which is what most people expect and how worldly people act. Responding to hatred with love just might grab someone’s attention and afford us a chance to share the gospel. When we respond in a manner that is unnatural, it displays the supernatural power of the indwelling Holy Spirit. Jesus was the perfect example because He was silent before His accusers and did not call down revenge from heaven on those who crucified Him. Thank you Jack! I am glad to call you brother! You are always an encourager! As I told the two gentlemen above, revenge is an “after thought”. It is where you decide for yourself that you are gonna make someone pay. I like how you responded in your comments above. It is much better than what I did! LOL! God bless you! Hello again Troy. I really appreciate how you responded in such a Christ-like way. It is encouraging to see men like you trying to keep unity in the body. You are so right. There is way too much condemnation in the body with gossip and other things. Although, I am still not sure where I might have given off a door mat mentality, it is reassuring to hear such humbleness in another brother’s words! God bless you Troy! Thank you Mr. Vidler. I am sorry for your situation but the Bible never approves of getting revenge (Rom 12:17-21) but “To the contrary, “if your enemy is hungry, feed him; if he is thirsty, give him something to drink; for by so doing you will heap burning coals on his head.” 21 Do not be overcome by evil, but overcome evil with good.” Pray for this man’s soul. Christ died for us while still His enemies (Rom 5:10). We are to do good to those who hate, pray for those who persecute us and bless those who despise us (Matt 5). That’s our calling as Christians. Thank you sir. Thank you Mr Wellman, I know you speak the truth. Did Jesus not get physically violent though, when the money changers abused the temple? If people cold bloodedly seek to destroy a marriage and subsequently a family. Surely there must be some way of detering this man? Thank you Mr. Vidler. Jesus had righteous indignation for the people despising the holy place where God placed His name and so He made a whip and drive out the moneychangers who were ripping people off by less-than-honest exchange rates. Even so, we must not take matters into our own hands and seek our own revenge as Paul wrote,”Repay no one evil for evil, but give thought to do what is honorable in the sight of all. 18 If possible, so far as it depends on you, live peaceably with all. 19 Beloved, never avenge yourselves, but leave it[i] to the wrath of God, for it is written, “Vengeance is mine, I will repay, says the Lord.” 20 To the contrary, “if your enemy is hungry, feed him; if he is thirsty, give him something to drink; for by so doing you will heap burning coals on his head.” 21 Do not be overcome by evil, but overcome evil with good” (Rom 12:17-21). Bad things happen when we take things into our own hands but God’s throne is a one-seater. So taking my minuscule problem into consideration I have with my current neighbors, I guess as a Christian I am suppose to let them ruin my life, which is what they are doing by the way, by not letting me sleep and disrupting the life of my 5 year old daughter by throwing objects at the wall and stomping around all hours of the night. How does one handle such a petty problem for 5 years now? I’ve already talked to them by the way which made the problem worse and I’ve asked the Holy Spirit for help with no response. I’ve now stooped to there level. I really don’t have time to play around because the Rapture is at hand. Any Advice? Hello Renee. Have you talked to the landlord? I would turn this in to them. They might not even know that one of their tenants is being such a noisy and terrible neighbor. I hate to see you stoop to their level but I would imagine its nearly impossible to be patient with them. Call the landlord and if they don’t do anything about it, tell them you’re going to look for another place to live. Besides that, there is little you can do.